SHERIFF VICTOR HILL Orders Female Placed #1 On His Top Ten Most Wanted For The Murder Of A Wanted Man. 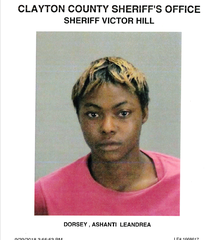 Ashanti Leandrea Dorsey made history in a way she should never be proud of when she became the first woman to make #1 On Sheriff Victor Hill’s Top Ten Most Wanted For Murder. Yesterday on Lakeview Way, Ashanti shot and killed Dontavious Maurice Morrison after a verbal altercation. Morrison was already wanted by Sheriff Victor Hill for charges after leading his Deputies on a high speed chase in the Iron Gate Subdivision before leaving a stolen firearm and drugs in the vehicle he fled from. Ashanti also shot at another man and missed causing him to flee for his life. Ashanti is a known prostitute and is a suspect in a series of robberies of men that solicited her services off of the internet. Everyone engaging in the dangerous activity of soliciting prostitution from the internet is placing themselves at extreme risk until Ashanti is caught, and they should seriously consider refraining from this illegal activity in the future. Ashanti is described as a 21 year old black female that is 5 foot 7 tall, weighs approximately 130 pounds, with black hair and brown eyes. Ashanti should be considered armed and dangerous and anyone spotting her should dial 911 immediately. Anyone with any information on the whereabouts of Ashanti can call the Fugitive Squad at 770-477-4479 or send an anonymous tip through the Nixel tip line.